For people my age, when you think of Tian’anmen Square one thing comes to mind. 1989. Civilian, many students protested in the square calling for democratic reforms. They were brutally suppressed by the military, thousands slaughtered. 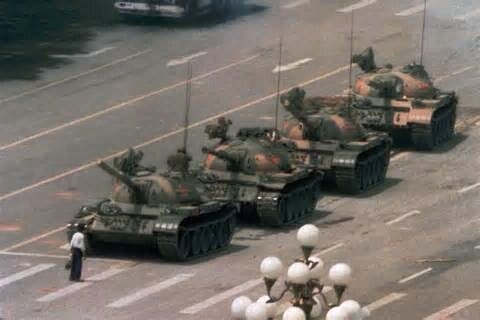 I remember the picture of one man standing in front of the tanks, refusing to move. I never thought I would ever stand in that square. Today, it looks much the same. It is gigantic, one of the ten largest squares in the world. The square contains the Monument to the People’s Heroes, the Great Hall of the People, the National Museum of China, and the Mausoleum of Mao Zedong. On Oct 1, 1949 Mao announced the founding of the People’s Republic of China in the square. Now that day is a national holiday. Thousands come to the square and visit Mao’s Mausoleum. Though we heard it was more country residents that visit Mao’s remains. They are less aware of the effects of the cultural revolution on arts and intellectuals in the cities. Tiananmen Square has a history of protests, but none were apparent today. Only lots of flags and flowers. …and Chinese people wishing to speak and practice English.